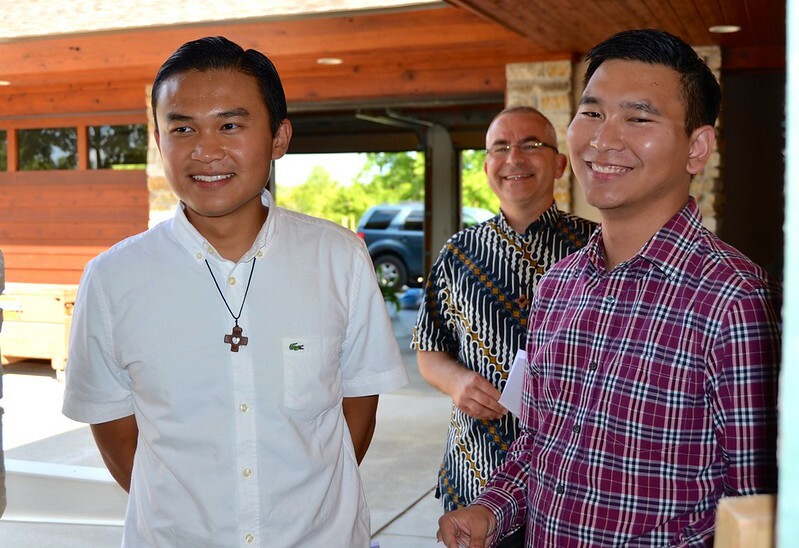 Paul Phong Hoang and Henry Nguyen were received into the novitiate for the US Province this evening. Paul, 25, is originally from Vietnam but has lived with his family in Houston since 2007. He graduated from the University of Houston in 2015, and studied philosophy and religious studies at St. Xavier University during his three semesters of candidacy. Henry, 28, was born and raised in Orange County, CA. He has a bachelor’s degree in psychology from California State University, Monterey Bay, and during candidacy began his theological studies at Catholic Theological Union and philosophy at St. Xavier University. Fr. Byron Haaland is novice master and Fr. Andrzej Sudol is associate novice master. Paul (Phong) and Henry wait to be called into the chapel. Fr. Andrzej, associate novice master, is in the background.